Here is tutorial to add a Talking Program Opener with an option Window in right click context menu without any software for your Windows 7 or any version of Windows PC. Let us proceed on how to make your Talking Program Opener with an option Window. You can use the program you most frequently use (PhotoShop or other Software) to open a particular file type. We have given the example of Notepad in this Talking Program Opener with Input Window. You’ll need to change the Cyan text (see the steps in later part of Talking Program Opener with Input Window tutorial) for program path. 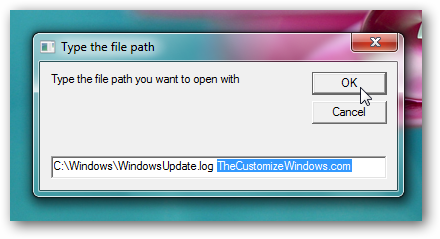 Put and set the default path to your working folder (Green text in example of Talking Program Opener with Input Window trick). Save the file as Talking Program Opener.vbs for the example above and do not forget to change the file type from text to All files from drop down menu in Notepad before saving it. Obviously, you can save with any name you like. The red texts are what the computer will speak in Talking Program Opener with an option Window program. The Green Text is what the Talking Program Opener prompt window will show as default path. The Blue Text is the program path of the program you want to use to open with Talking Program Opener with Input Window. 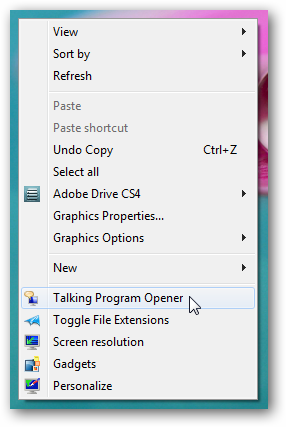 Double clicking the file will bring the Talking Program Opener with an option Window. Place the Talking Program Opener with an option Window vbs file created in the previous step at the root of C drive. For modification of the registry file options, see this tutorial. Save the file as Add Talking Program Opener.reg and do not forget to change the file type from text to All files from drop down menu in Notepad before saving it. Name does not matter here at all. You can save as you like. Now, double click the reg file and accept the security warnings and you will see the Talking Program Opener option in right click context menu when clicked on a folder or any empty place inside folder or Windows 7 desktop. Add a minus sign before the H starts after the third bracket; like [-HKEY_CLASSES…. to all where there is HKEY and save it (with some good name) as reg file and run it. Obviously, you might delete the Talking Program Opener vbs file manually too. Talking Program Opener will work on Windows 95, Windows 98, Windows NT, Windows 2000, Windows Millennium, Windows XP, Windows Vista, Windows 7, Windows 8. As usually all the required files are here for the Talking Program Opener is for your download. I found your site by accident and have been here for hours. In fact I have not slept all night as I have found your site so interesting, especially the tutorials section on speech. It is all fascinating. How do I place the vbs file at the root of C:drive ? Could you please be a bit more specific, the more detail the better. I have placed the vbs file in numerous places on the C: drive to no avail … I am obviously doing something wrong. I am very glad that you’ve liked this website. Root of C drive means right in the C partition. NOT inside any folder in C partition. See the screenshot of mine, that might help you : Click Here I’ve shown the properties of another VBS file at the root of C drive. 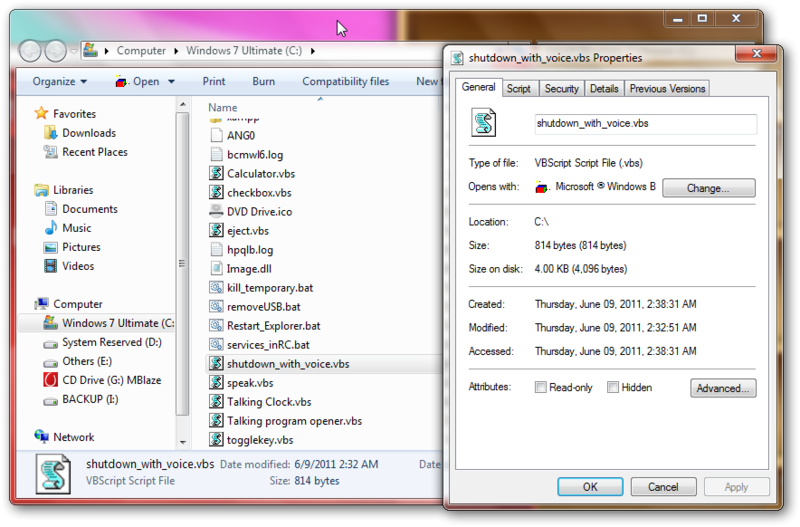 Look the Explorer Window, there is the Talking Program Opener VBS file too. Copy the VBS file, go to Computer (that was My Computer in older version of Windows) > double click to open the C partition (commonly said C drive) > Scroll down to bottom and right click and then click Paste (or CTRL + V key combination). Make sure that you are pasting right in the C; not inside a folder. To avoid the problem of pasting inside a folder; maximize the screen, right click. It will give you a security prompt; accept it. Alternatively, you can place it in other places; in that case, you have to change the path of vbs file parameter in our registry file of this tutorial. I had tried where you kindly linked pictures so I would not be mistaken. as my flash driver keeps crashing. I will do a quick fresh install and then try again. I will post to let you know the results. Once again many thanks for your quick response. Thanks and welcome Deano. Definitely let me know what happened. Before going for a fresh Installation; you can ask Corrine (of Security Garden : link at our footer) if it is a problem with Malware, she might be able to help you. Cite this article as: Abhishek Ghosh, "Talking Program Opener with Input Window in Right Click Context Menu," in The Customize Windows, July 2, 2011, April 18, 2019, https://thecustomizewindows.com/2011/07/talking-program-opener-with-input-window-in-right-click-context-menu/.